Dr. Adams is a native of Tippecanoe County. She grew up in West Lafayette and graduated from West Lafayette High School in 1992. Following her graduation she went to Huntington College and procured a bachelor degree in science. Dr. Adams entered Indiana University School of Dentistry in the fall of 1995 and earned her doctorate there in July of 1999. Dr. Adams has had a broad scope of practice experience since obtaining her degree. 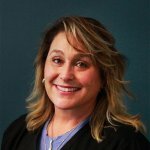 She has worked in many dental settings including: a men’s prison, as an associate for several different doctors in Indiana, in corporate practice, on a mobile unit travelling to assisted care facilities and nursing homes, and in community health centers in both Indiana and Virginia. A majority of her experience has been in public health, with 8 years as a Dental Director for two different facilities. In 2012, Dr. Adams moved back home to Indiana to be closer to her family. In February of 2015 she purchased the office of Dr. Erin Evans. She still maintains her presence in the community health center environment once a week (on Fridays, when her own practice is closed). Dr. Adams has one son, Ziad. She enjoys traveling and spending time with her son. 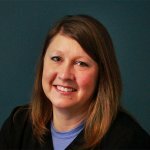 A graduate of Indiana University-Purdue University in Indianapolis, Tina has been practicing as a licensed dental hygienist since 1996. A native of the Lafayette area, Tina graduated from Jefferson High School and continues to make her home in Lafayette. She has worked for many local dentists throughout the years as either a substitute or part-time staff member. 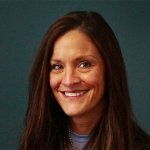 In order to become well-rounded in dentistry, she obtained another degree from Indiana University-Purdue University in Fort Wayne in Dental Lab Technology in 2007. She started working full time for Dr. Erin Evans in September of 1999 and continues to work there after Dr. Adams bought the practice. She enjoys patient interaction and maintaining healthy smiles. She loves spending time with her husband, John, of 25 years along with her three daughters: Kelsey (husband: Brett), Emily (husband: Jeff), and Corrine. As a family, they enjoy traveling and camping. Her hobbies include golfing, fishing, cooking and reading. Rachael received her dental assisting degree from Ivy Tech in 1991. In 2002, she attended Ivy Tech for training to become an Expanded Functions Dental Assistant which allows Rachael to place the fillings after Dr. Adams has prepared the tooth. She thoroughly enjoys her job and takes great pride in offering the patient great care while in our office. She has worked in this office since 2004. Rachael married her husband, Wes in 1992 and they have two boys, Jacob and Tyler. In her free time, she enjoys horseback riding, hunting, fishing, camping and just spending time outdoors and with her family. Kim received her dental radiograph certification in May 2008 after working in the dental field for 7 years. She has held positions in both adult and pediatric practices, making her very well versed in the dental practice. She enjoys welcoming patients with a friendly smile and making them a part of our dental family. She considers it a top priority to provide good customer service with ethics.Kim married her best friend and high school sweetheart, Travis in 2001. They have two children, a daughter and a son, who keep them very busy with sports and other activities. The family is an active part of Crestview Community Church. In Kim's free time, you can find her cruising the Caribbean Islands or on any other beach seeking the sun. Making memories with family and friends brings her great joy. 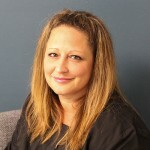 Tina S brings over 25 years of dentistry experience to our office. She graduated from Ivy Tech and has received training in all aspects of restorative dentistry. Tina really enjoys getting to know her patients and making it a comfortable and pleasant dental experience. Tina also loves to travel and spend time outdoors with her husband and two boys.